Josie Abruscato hasn't added a story. This fundraiser is for my little sister Vanessa - she is a beautiful, vibrant, smart 21 year old woman who suffers from a condition in her brain called an AVM (Arteriovenous Malformation) which is an abnormal connection between the veins and arteries. On August 1st 2013 Vanessa suffered a massive brain aneurysm and she was left fighting for her life. She was on complete life support and in a coma, we were told by many doctors/specialist that she was completely brain dead and to say our goodbyes. Miraculously Vanessa woke up and has been recovering everyday since. She spent 3 months in the hospital and then went off to a rehabilitation hospital where she spent 6 weeks and had therapy daily. Unfortunately everyday is still a struggle,the aneurysm affected her balance, motor skills, eye sight and speech - she is relearning how to talk, walk, eat, basically everything and still unable to care for herself so she needs constant care. Vanessa is so determined and is working very hard and progressing very well but the government funded rehabilitation is coming to an end and the cost of Physiotherapists, Occupational Therapists and Speech Therapists that specialize in neurological related injuries can cost upwards of $150/hour. Her recovery will continue to be a slow and steady road however we need some help to continue supporting her through this journey. A bit more about Vanessa...Prior to the aneurysm Vanessa was a full time student in University studying to become a speech pathologist - this year would have been her final year before starting to study for her masters degree. She worked part time and volunteered at non-profit organizations, speech clinics and the Toronto School Board and some of her hobbies were singing (https://www.youtube.com/watch?v=uU9rrZzn7Ek) and reading. Vanessa is someone who has a passion for helping others and has touched the lives of so many people - now we are asking for your help to make an impact on her life, so she can get the help she needs. Both my parents are working full time trying to support their family and Vanessa in all she needs. However the night of Vanessa's aneursym my dad also suffered a heart attack, my dad and sister were both in critical care in the same hospital at the same time. This meant that both my parents were not working, my dad for 3 months and my mom for 6 months. This obviously left them with some financial difficulty which makes it that much harder to pay for all the rehab Vanessa needs. Thank you for taking the time to read Vanessa's story and for helping to Achieve Vanessa's Miracle ‎your donations will go towards her rehab and therapy, as this woman who is so strong and fights for her health can regain her dream of helping others in speech pathology, community service, her love of life and having hope for a future. ‎(Due to this website taking a percentage of the donations, we will be also be accepting donations in other forms (email money transfer, cheque, etc) which will allow the donations to go further, if you are more comfortable with that option. My email is jabruscato@gmail.com I will keep everyone informed as to our total donations in those forms once we start to receive them.). Josie Abruscato hasn't posted any updates yet. 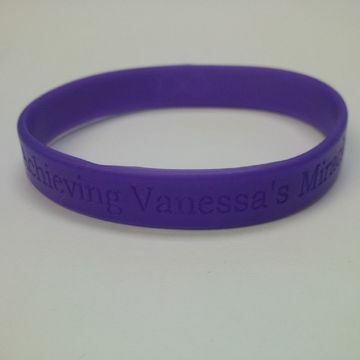 These bracelets were made to show our support for Vanessa during her recovery. The bracelet says: "Achieving Vanessa's Miracle" which also stands for AVM (the condition she suffers from), on the back of the bracelet is the infinity symbol to signify our support and love for her that is never ending. The wonderful people at www.wristbandswithamessage.com donated many bracelets to help with Vanessa's Fundraising Campaign. Josie Abruscato is managing the funds for this campaign. The campaign is for a personal cause.